If it’s true that, on average, business decisions include up to 5.4 people it’s crucial that your sales teams extend their reach, go deeper and better understand the DNA of their prospect. Salespeople need to reframe their conversation to address the various beliefs, biases and business objectives of each member of the buyer’s team. Easier said than done, right? Perhaps, but today’s business transparency makes it easier than ever. From websites featuring their executive teams to full staff listings to LinkedIn and other social platforms, we can dial in and identify key people who may have a voice in who their organization does business with. The days of having a main point of contact and never going above or below or around them are over. 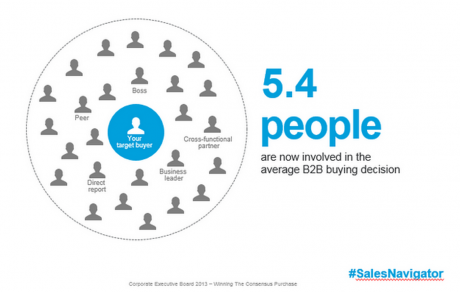 Nothing stalls a sales cycle more than only having one point of contact in an organization. Today a hive, or collection of key contacts, within an organization increases the chances of building strong, long-term business relationships. Think across the enterprise to executive leadership, HR, Marketing, Sales, IT and Operations. Who are the 5.4 people you should know? Ask your current clients who they include in their buying decisions. Notice who normally initiates an inbound prospect call with your company. Ask your colleagues who they normally see during the first, second and any ongoing meetings. Review the executive team on the website and notice if those people include IT, HR, Sales, Marketing, Operations and the CEO/President/Owner. Ask your ownership who they include on buying decisions. Now that you are dialing in on the right people, take the next step and get specific and personal. Remember, the more people you bring to the table initially, the greater the chance of shortening the buying process. Go to LinkedIn and study their LinkedIn Company Page. Are they posting content that can be useful in your sales conversation? Know their name and role (especially when arranging the meeting with your point of contact). How long they have been in the organization? How do they talk about themselves and their organization? How are you Connected to them? If you are an advanced LinkedIn user, consider Sales Navigator where LinkedIn serves you an account-centric view of your clients and prospects. Set your ideal customer/client and LinkedIn will serve up prospects and show you how you are Connected to them. And, it gets even better, if you have a team using Sales Navigator, tap into Team Link and it will show which of your colleagues is connected to the person/people you need to potentially know. This is what Mike Derezin, the VP of Sales Solutions for LinkedIn, calls going from “serendipity to science.” Want to learn more from Mike? Watch Mike Derezin discuss social selling and Sales Navigator. Make sure you are Connected to others in your organization because they may be Connected to someone in your prospect’s organization that could be helpful to you. If you have strong, collaborative working relationships with your colleagues, you can ask them for an introduction or recommendation. The goal, ultimately, is to build a diverse, external network but we also have to leverage our internal networks to help us gain collective advantage. This is also primarily why leaders need to be Connected to producers. In a recent post, I talked about trying to reach and connect with the CEO immediately and how it may not be the smartest way to go. Instead build out your network to include various types of people in different areas of business. Once you’ve identified your 5.4s, frame your value proposition and conversation to include each of them. Remember, they represent various areas of the organization and are responsible for results in these various areas so know what those areas are and speak to them upfront. You will gain credibility and trust. You see, it’s not rocket science. It is more upfront intel, a more refined process than dialing for dollars, spray and pray and hope as strategies. LinkedIn’s data shows that 51% of salespeople who embrace social selling reach their quota and 45% say they have more opportunities. Considering that marketing delivers anywhere from 25-30% of leads, that means that sales is responsible for at least 70% of their own leads. I don’t know about you, but if my income is based on what I close, I’m going to want to make sure I use all of the best practices to meet my quota. I’d love to hear how you use LinkedIn and other social platforms to find and secure your best leads. And, don’t forget to look for your 5.4s.